Temenos viewed from north west, with Middlesbrough F.C. Riverside Stadium shown in background. The Tees Valley Giants was intended as a £15 million series of five art installations by sculptor Anish Kapoor and structural designer Cecil Balmond. The artwork was planned to be created in the towns of Darlington, Hartlepool, Middlesbrough, Redcar and Stockton on Tees in the Tees Valley area of England. The project was launched in July 2008 by Tees Valley Regeneration. If completed, the project would become the world's biggest public art project. Five structures were planned: however only one, Temenos, has been unveiled. However, in September 2012, Kapoor insisted the other projects would go ahead. But by September 2016 no progress had been announced. Temenos was the first sculpture for the Tees Valley Giants project to be announced. It is approximately 110 m long and 50 m high and cost £2.7 million. The steel structure consists of a pole, a circular ring and an oval ring, all held together by steel wire. The structure is situated in the Middlehaven area of Middlesbrough, close to where the Transporter bridge is located; construction work started in autumn 2008, was completed by spring 2010, and officially presented to the people of Middlesbrough on 10 June 2010. The name 'Temenos' comes from the Ancient Greek (τέμενος < τέμνω, temno, to cut) term for land cut off and assigned as an official domain, especially to kings and chiefs, or a piece of land marked off from common uses and dedicated to a god, a sanctuary, holy grove or holy precinct. Temenos was funded by the Government Initiative, The Northern Way, the regional development agency One NorthEast, the Arts Council England, the Northern Rock Foundation, Middlesbrough Football Club and BioRegional Quintain. The other four structures were never formally announced, and in June 2012, the BBC revealed that plans for them had been put on hold: it currently seems unlikely that funding for them will be secured. However, in September 2012 Kapoor insisted all of the structures would go ahead. However, the project then slipped out of the news until May 2018 when Stockton Council was hoping to revive the scheme by seeking funding from Tees Valley Combined Authority for a second sculpture. ^ "Monumental artwork plans revealed". BBC News. 10 July 2008. Retrieved 16 May 2016. ^ Roy, Amit (1 July 2008). "Indian mind for 'largest' art". The Telegraph - Calcutta (Kolkata). Retrieved 16 May 2016. ^ "The Tees Valley Giants". Gazette Live. Archived from the original on August 3, 2008. ^ "Art - Tees valley regeneration". Tees Valley Regeneration. Retrieved 16 May 2016. ^ Westcott, Karen. "Tees valley giants unveiled today". The Northern Echo. Retrieved 16 May 2016. 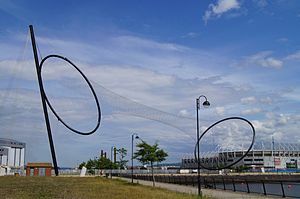 ^ "The rings of Temenos: Anish Kapoor in Middlesbrough". Archived from the original on February 9, 2008. ^ Brown, Mark (10 July 2008). "Big in Middlesbrough: Anish Kapoor unveils plans for giant public artqwork". The Guardian. Retrieved 16 May 2016. ^ Karen, Westcott (10 July 2008). "£15m public art project revealed". The Northern Echo. Retrieved 16 May 2016. ^ "The net tightens on Valley 'giants'". The Journal. 26 June 2013. Retrieved 16 May 2016. ^ "Huge £2.7m Temenos sculpture unveiled in Middlesbrough". BBC News. 10 June 2010. Retrieved 15 February 2016. ^ "Teesside art 'giants' plan axed". BBC News. 19 June 2012. Retrieved 19 June 2012. ^ Metcalfe, Alex (21 May 2018). "A giant sculpture and museum revamp: Bullet points from Stockton council meeting". GazetteLive. Retrieved 29 May 2018. This page was last edited on 30 December 2018, at 19:10 (UTC).